The small Danish town of Helsingør in North Sealand and the similarly named Helsingborg in west Sweden, are connected by a mere 20-minute boat ride across the Oresund Sound, meaning you can cleverly combine two countries in one easy visit and discover everything these picturesque towns have to offer. 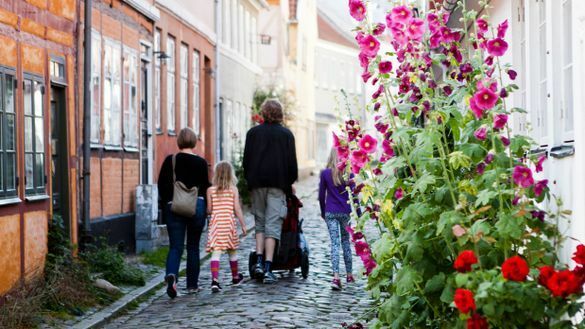 There has never been a better time to explore the castles, parks, gardens by bike, car or train and sample the very best in modern Scandinavian cuisine that the regions have to offer on a weekend break only 45 minutes by train from Copenhagen. Helsingør makes the perfect base to explore North Sealand. With Denmark’s 5th national park, the National Park of Royal North Sealand, having opened in May and right on the doorstep, it offers a wealth of natural and manmade attractions to be enjoyed along its extensive coastline, inland and within the city itself. Part of the 263km2 new National Park, the country’s second largest lake Esrum Sø provides an idyllic backdrop to explore Fredensborg Palace, one of the residences of the Danish royal family where Queen Margrethe’s very own private garden and Orangery is open for visitors in July and early August, and the 12th century Esrum Abbey. With more royal pickings, also enjoy two of Denmark’s UNESCO World Heritage sites, the Royal par force hunting forests at Store Dyrehaven and Gribskov which were landscaped specifically for courtly hunts and the Royal Castle of Kronborg where Shakespeare’s Hamlet comes to life as part of the annual Shakespeare Festival with re-enactments in English taking part from June through August each year in celebration of its 10th anniversary. In addition to a new self-guided Elsinore Walk brochure providing a fascinating wander through 800 years of town’s history, there is plenty more to explore further afield. Visit the neighbouring town of Hillerød to see Frederiksborg Castle, the largest Renaissance Castle in Scandinavia, which showcases over 500 years of Danish history through portraits, history paintings, furniture and decorative art, and is surrounded by beautiful gardens and a lake. Or take a bike ride down the coast to the famous Sculpture Park at Louisiana Museum of Modern Art. Overlooking the sea, with the Swedish coast visible on the horizon, it contains around 60 sculptures forming part of the museum’s world-renowned collection. Open late on Friday nights, it is also a popular location for dinner with locals who come to enjoy the art and expansive sunset views over a delicious buffet of Danish dishes from the museum’s perfectly positioned café. Staying in and around Helsingør, make the most of the wonderful stretches of beach at one of the many beachfront properties or just a few minutes’ walk away from the sea. Marienlyst Strandhotel – a 4-starred modern seaside hotel with a history dating back to 1861 – offers oceanside rooms with the added relaxation of a recently renovated spa which features a bathhouse, panoramic sauna overlooking the sea, heated pools and a salt therapy room. Alternatively two streets back from the beach, the beautifully renovated 36 room boutique Hornbækhus Hotel, which reopened in June, cleverly complements early 1900s architecture with colourful modern textiles to offer a choice of fresh, light living spaces, communal dining, morning yoga and an assortment of changing activities. Situated on the beach road that winds along the coastline from Copenhagen to Helsingør in the old fishing town of Skotterup, Hotel Villa Brinkly is a charming alternative. Dating back to 1873, a stone’s throw from the beach and the famous Egebæksvang Forest, it offers a real taste of the Danish landscape and cuisine with owner/chef Anette Buch Petersen creating tapas style grazing platters on request that can be taken in the newly renovated living area or on the pretty patio outside. Helsingør is also home to an excellent selection of eateries, ranging from it vibrant street food market, where shared tables meet a mix of eclectic cuisines in the halls of the former Helsingør Shipyard, to some impressive fine dining options such as Restaurant Sletten in the lovely old neighbouring town of Sletten. Owned by Kristian Arpe Møller and Rune Amgild Jochumsen, the chef duo behind Michelin-star restaurant formel B in Copenhagen, the emphasis is on a ‘less is more’ philosophy using only the finest ingredients. With plenty of places to sit out and enjoy a casual lunch, don’t miss the sunken former outdoor dock area at the Maritime Museum, an unusual suntrap serving up a selection of different pickled herrings in a fascinating historical maritime setting. Crossing over to the Swedish side of the sound, Helsingborg is renowned for its cuisine, with a strong tradition around food and drinks, with lots of restaurants and producers nearby. In Helsingborg itself, visit the site of the original Viking settlement in Slottshagen Park. Built on in the shadow of the medieval fortress tower of Kärnan, it features beautiful gardens, an open-air stage, and a playground originally built in 1906 and redesigned in 2016 to reflect the area’s medieval heritage. Located just north of Helsingborg, take a short bike ride to historic Sofiero Castle and Gardens, the former summer residence of the Swedish Royal Family, where Royal gardening heritage mixes with innovative garden design. Explore gardens of roses, scented flowers and a rhododendron ravine, linger over lunch at Sofiero Palace Restaurant – one of the top restaurants in Sweden or visit during The Grand Gardening Festival from 24 – 26 August when enthusiastic gardeners flock to see conceptual gardens and meet the experts. Alternatively, hop on the new ferry line, a fast-paced trimaran, to the small island of Ven, an idyllic enclave of small winding roads, green meadows and rolling seas. Easily explored by bike for the day, visit the museum dedicated to the scientist Tycho Brahe who built the castle of Uraniborg and the underground observatory Stjerneborg, the Whiskey Distillery Spirit of Hven and 13th-century church at the top of the steep slope overlooking Kyrkbacke harbour. Travelling a little up the coast from Helsingborg, explore the Bjäre Peninsula as part of the new Båstad Hiking Festival. Taking place from 12 – 14 October, it features a guided walk through the history of Båstad, morning yoga, nine different hikes and themed activities by the sea. Adding to a good selection of accommodation, ranging from hostel-styled accommodation at Cityvandrarhemmet to stylish boutique hotels such as V Hotel Helsingborg, Clarion Hotel SeaU Helsingborg, a new 250 room hotel will open on a prime waterfront location in 2020 with a spa, rooftop, restaurant and bars. To get a feel for Swedish food and wine, dine at one of Helsingborg’s most popular restaurants KOL & Cocktails which focuses on charcoal grilling – one of the biggest growing trends in Scandinavian gastronomy or take a trip to the covered market, Höganäs, just up the coast from Helsingborg to sample a superb range of speciality Swedish meats, fruit, vegetables, bread, and drinks. Wine lovers can also get a great taste for Swedish wine exploring one of the five vineyards just outside of Helsingborg, including the award-winning Kullabergs Vineyard which recently received an award in the ‘International Wine Challenge’ in London. There are plenty of daily flights from the UK to Copenhagen. SAS operates from Aberdeen, Birmingham, Edinburgh, Heathrow, Newcastle and Manchester. Ryanair from Stansted; British Airwaysfrom Heathrow; EasyJet from Bristol, Edinburgh, Gatwick, Luton and Manchester; and Norwegian from Edinburgh and Gatwick.